Rain will turn back to snow this morning across the Finger Lakes as cold air returns to the region. Already, snow is falling across Western New York where temperatures have fallen back into the low 30s. As of 7am, most of the Finger Lakes were still in the low 40s. The snow will make steady progress east ward this morning, reaching the I-81 corridor around or shortly before noon. Once the rain turns to snow, expect two to three hours of steady snowfall. Most places will see accumulations of an inch or so, but some parts of the eastern Finger Lakes could see two or three inches. This will especially be the case over higher elevations. The snow will taper to a few stray flurries for the mid to late afternoon and evening hours. Temperatures will fall into the upper 20s this afternoon and winds will increase with top gusts around 30 mph. Behind today’s storm system, a new weather pattern will set up with alternating bouts of lake effect snow, bitter cold, and widespread moderate snows. Most of these lake effect events look to favor areas due east of the Great Lakes, which usually have less of an impact locally but can bury the Tug Hill region in feet of snow. The first lake effect event will set up on Friday starting on southwest winds. This could send some squalls into the I-90 corridor. These squalls should be transient and short lived with only an inch or so of accumulation. Wind direction will be unstable on Friday, and a brief turn to the northwest could bring squalls in off Lake Ontario in the afternoon, again mostly for northern parts of the Finger Lakes. West winds will keep the lake effect snow band along the short of Lake Ontario, or just out over the lake, Friday night into early Saturday. 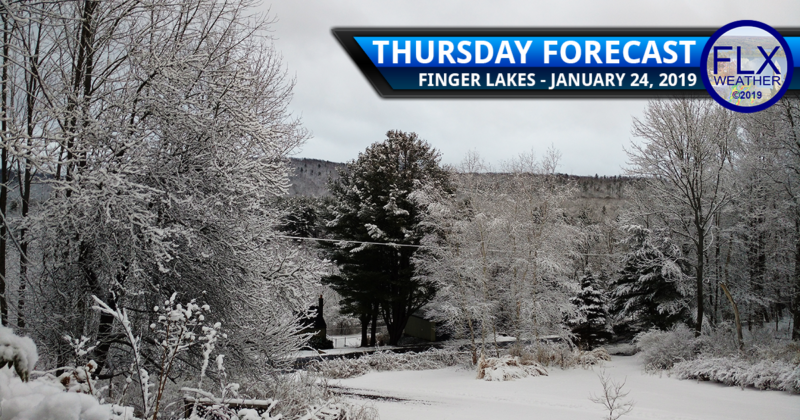 Only a few flurries off Lake Erie will make it into the Finger Lakes. While most of the region will see very little snow on Friday, it will be cold and windy. Wind gusts of 30-40 mph are likely with higher gusts in any lake effect squalls. High temperatures will be in the mid 20s, but wind chills will in the single digits much of the day. Saturday will start with a few subzero readings in the Southern Tier with single digits elsewhere. It will be a quiet day, but high temperatures will only reach the upper teens to 20 degrees. The next widespread snow will come in Sunday afternoon and evening with a general 2-4 inches falling. Lake effect will develop immediately behind the system to the east of the Great Lakes. High temperatures Monday will be in the single digits with subzero wind chills throughout the day. Another widespread snow is likely Tuesday morning with additional lake effect and frigid air behind that system. Temperatures may then spend several days at or below 10 degrees with morning lows below zero. Zip-code forecasts only available for zip codes within the 17 county FLXWeather forecast area, which stretches from Wyoming County in the west to Onondaga and Cortland county in the east. Only enter the 5-digit zip code with no spaces. We are planning to drive to Ithaca from Northern Virginia on Friday. We normally take 15 through PA coming into Ithaca from the south on 13. We would arrive in Ithaca by late afternoon. Should the roads be okay then, or do you expect ice? You should not have any problems…no ice, little to no snow.